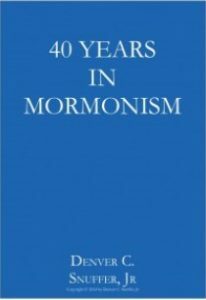 I remember the excitement in the online world when the document “Further Light and Knowledge” made the rounds among the early Mormon Internet reading groups. I’m an old man so I remember Mormon-L and other such groups where communication was not like it is on Facebook or blogs. It was more of a mailing list where people shared documents. We read them then offered our opinions and observations. That always bothered me. Frankly, I didn’t believe it. When I prayed about it, I felt otherwise. It was many years before I found the courage to pray in my home as taught in the temple. I learned long ago prayer circles were regularly conducted outside the temples in homes and stake centers until banned in 1978. I guess the Brethren felt the people couldn’t handle it. Looking at Jim Harmston, perhaps they were right. I have always been a rebel and I know it. I have always questioned why we do things a certain way. I guess it started in elementary school. I am a kinesthetic learner, although I didn’t know it at the time. I simply couldn’t sit still for lectures. Unless I was doing something with my hands, I was not learning. I am still that way today. My work on computers today is hands-on. I learn new skills only by practicing. Shouldn’t it be the same way with spiritual skills? Adam and the patriarchs built altars. Why don’t we? What is significant about altars? Does it mean something to heaven when we build an altar and then consecrate it to the Lord? I think so. What about a home altar? Why are we not taught about this in the LDS Church today? Do the Brethren not trust us? Apparently not. Yet they were common in early Utah. I confess I was attracted to the writings and activities of Jim Harmston. Here was a man who was holding study groups in his home. The Brethren became so concerned they published an edict that such groups were not to be held, mainly because it could lead to experimenting with spiritual things that could open the portals of heaven and hell. Guess what? In this case, the Brethren’s warnings were are still are correct. Jim Harmston is dead now. Died of a heart attack a few years back. 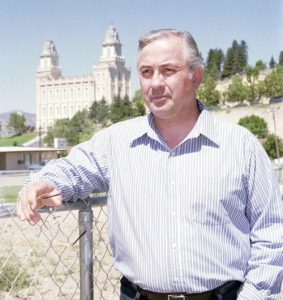 His movement, the True and Living Church of Jesus Christ, based in Manti, has all but died out. We called them the Manti group and spoke of them in hushed tones. They were onto something. Jim claimed heavenly visits at the altar. He went past the will of the Lord when he instituted polygamy and then predicted a day that the Lord would return. Wrong. Big mistake. False prophet. I can see why people compare Denver Snuffer to Jim Harmston. Denver has declared he has met with the Savior. Not once, but many times. He claims he has communed with the members of the Church of the Firstborn. I believe him. He says he is doing the work of the Lord. He declares the heavens are opened. He has declared we will need a temple to be sealed to the Fathers. Hmmm…what makes him different from Warren Jeffs of the FLDS and whoever is leading the AUB today? Or one of the many dozens of offshoots that are all insignificant and failing or failed? There may be thousands who have read Denver’s writings and thousands who have been baptized. The Brethren are obviously concerned about him as evidenced by the recent “Boise Rescue” meeting with Dallin Oaks last month. How can one know for themselves that the work being conducted by Denver Snuffer is approved by the Lord? It seems to me it will always be a small minority of people who adhere to what he has shared, but maybe I haven’t caught the big picture let. I confess I’m a fledging when it comes to what Denver has said is possible. I have not been in the presence of the Lord, nor do I expect to be for many years to come. Please don’t tell me I’m obsessed with Denver. I’m just trying to analyze the remaining questions from the interview. I can’t wait for the next one in which I asked him about dancing on the Grand Mesa and calling for Mother in Heaven to manifest herself. His answer leaves no room for doubts. Some early students who listened to what Denver had to share have now turned away. But that’s for the next post. Question Seven: I have heard you say, and read in many places in your books and on your blog, you dislike the public attention received as a result of performing the assignments given you by the Lord. You’ve been emphatic we should not replace one idol with another. Yet the people look to you for leadership. For example, in the Phoenix lecture you provided some direction on tithing, the sacrament, ordinations, worship or fellowship groups, and in particular, the requirement that the approval of seven women is needed to sustain a man in performing ordinances in public. You also said a man was unworthy – the Lord’s word – if his wife will not sustain him. In the Jewish tradition, when questions arise, everyone turns to the Rabbi. In the LDS Church, local leaders consult the handbook or turn to a General Authority for help with difficult procedural questions. You have stated you don’t like the term used by some – Snufferites – to describe those who read your writings. You have made it clear every man should have a sufficiently strong relationship with the Lord to get answers to procedural and doctrinal questions. Yet, you are the one the Lord sent as a servant, witness or messenger to declare the orderly dismantling of the established hierarchy. Does that not make you a prophet and de-facto leader? ANSWER (Denver): Let me clarify. I view my role only to be a teacher at this point. I hope to remain in that role alone. But I would hasten to add, that if you search the scriptures to look at what role was occupied by Enoch and the success that he had in his day, the only thing he claimed to be was a teacher and a preacher of repentance. That’s it. The success he had was not because he was some great dictator, it was because he was a teacher that provoked people to repent. Melchizedek, Joseph Smith clarified, was not a king of a city, or king of a country, he just preached. He was a teacher and a preacher. 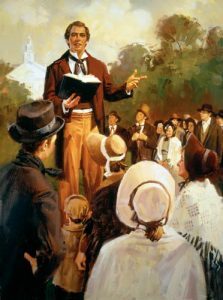 He preached and the people, according to the Book of Mormon who heard him, Alma clarifies that they were wicked people, but they repented. (Alma 13:17-18.) And because they repented they were able to gather and live the principles that brought them together. I think the idea of a strong central leader is no more likely to succeed in our day than it was in Joseph’s. At the end, when Joseph lamented that the people were depending too much on the prophet, and they were neglecting the duties that were devolving upon themselves, therefore they were darkened in their minds. (TPJS, p. 237-238.) It was too late. In 1842 when he made that comment in the meeting of the Relief Society, it was too late. The moment had passed. They were dependent upon him. I try to learn from earlier examples and not repeat the same errors. If there are errors to be made, I want them to be new ones, not a repetition of the same old ones that caused the failure before. The responsibility of preaching the Gospel is to take the burden and put it upon the individual; to have the individual connect to God. One man being saved and saying, “I’ve got a pipeline to God, and so now I get to be your boss,” won’t save him nor those who listen to him. But someone who says, “God is willing to speak, and does speak to every one of you,” and who teaches to encourage you to use the gifts that God gives every one of us, that teacher may help others. All individuals have gifts, and curious though some of them may be, all of us have some kind of gift. Use it to reconnect to God. And then build upon that to have your life filled with light and truth. I really think it is unnecessary to build a new canon of scripture when we haven’t paid enough attention to the canon of scripture we have already. We need to plumb the depths of the volumes that we have been given and figure out what they are saying, because they say whole lot more than we have drawn out of them as yet. What I’ve talked about in the 10 lectures and in the 14 volumes I’ve written is the scriptures. Hopefully it serves to remind people of what the scriptures actually do contain, because they are plentiful. And I think the only role I would carve out for myself is a teacher. Denver’s answer here was rather short. I suspect there is so much more that he could have shared. His humility is evident, at least to me. I like the man. Carol does not. She sees what he has done or is doing as divisive. I see it as fulfilling a deep-seated and long-held request from the Lord to understand Zion and how I can participate in the bringing forth of the latter-day Temple. Lord, I ask to be used in this area. It’s not about altars, names, tokens, or signs. It’s about the things they represent. Once you are keeping covenants of obedience & sacrifice, gospel, chastity, consecration, and have charity–no ill feelings toward your neighbor–then you are ready to receive power to pray in a way that God will grant unto you the things you pray, because you won’t ask for anything you shouldn’t. Helaman 10: 5 And now, because thou hast done this with such unwearyingness, behold, I will bless thee forever; and I will make thee mighty in word and in deed, in faith and in works; yea, even that all things shall be done unto thee according to thy word, for thou shalt not ask that which is contrary to my will. 6 Behold, thou art Nephi, and I am God. Behold, I declare it unto thee in the presence of mine angels, that ye shall have power over this people, and shall smite the earth with famine, and with pestilence, and destruction, according to the wickedness of this people. 7 Behold, I give unto you power, that whatsoever ye shall seal on earth shall be sealed in heaven; and whatsoever ye shall loose on earth shall be loosed in heaven; and thus shall ye have power among this people. So, what gifts are these whose use will reconnect us to God? I associate virtually with some folks with healing gifts. I imagine that as they grow in their gifts they will tap into the Lord’s power to bless His children. They will know what it feels like to serve and bless the lives of others, as our Savior did. They will learn to give all glory to God, and not keep any for themselves. I think I have (at times at least) the gift of teaching. I can understand that I may help others with it, but how will it help me? We are now ready to be taught the true order of prayer. Great now that you know it, make sure you never use it for yourself…..I never really thingy about it that way. 6 months back a family member was having an extremely difficult time. We were all together as family about 8 of us and I got the impression that we should form a circle and go around each saying a prayer. It was a very important moving and spiritual experience and I’m convinced it looked the person through a suicidal time. Now we didn’t join hands, we just knelt in a circle but it occurred to me that we were kind of doing the true order of prayer at least in part. This also reminds of the time I felt impressed to consecrate my own oil right after I received the priesthood. I followed the directions with the approved oil and felt very edified by the experience only great feelings of approval. I later told my bishop and his face dropped, he looked very concerned. He told me that was an ordinance that should typically be performed by the elders quorum and to ask for permission first before doing that. I felt horrible! He was a great by the way…..just doing what he thought was right. I’ve always blessed my oil at home. Yep, there shouldn’t be anything weird about consecrating your own oil. The Handbook says “One or more Melchizedek Priesthood holders must consecrate olive oil before it is used…”, so it sounds like you can do it by yourself, alone. Wow, I’ve never heard that. You have the priesthood, you can consecrate your own oil. It is not reserved for the Elder’s Quorum. I have seen it done that way, simply because they consecrate a larger bottle and share it amongst the group, but that is the only reason. Not sure what this bishop was thinking. And yet the scriptures say very little. Regarding the blessing of oil. Reply to Niklas didn’t cascade properly. I’m not saying this to judge anyone at all. I just think it’s interesting that some use the “divisive” nature of Denver’s message as evidence that he was not sent by Christ. I can’t help but think of the parable in “Ten Parables” about the mighty horse Ajax, whose actual attributes of strength and ferocity were considered too vulgar and undignified by those who had never been in his presence, but yet revered their own version of him. Is the Lord not both a lion and a lamb, lying together in the same personage? Is not also every servant of His the same, who will be saved because they seek to be precisely what He is? I can’t think of a prophet who was not divisive in the eyes of the world. 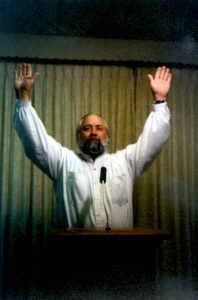 Tim, so Denver has no respect for people who call themselves Snufferites or Denverites, so what does he think of people who dedicate blogs, websites and forums to discuss his teachings? It is obvious to some of us that Denver is setting himself up as a leader. As I have said so many times, why does anyone want to preserve an Aaronic restoration when God has so much more to give us? It is going backwards, not forwards. The subtlety of Denver’s words are very interesting to me. He says he is not a prophet, he considers himself JUST a teacher and then immediately he is programming all of you to shift your minds from thinking of Enoch and Melchezidek as anything other than teachers. Does anyone understand about the energy of programming? Do you not see what is happening? Maybe I’ll be completely banned by Tim for voicing my concerns. But I have experienced “programming” before and therefore can speak from experience. There are websites and forums and blogs dedicated to Denver instead of Jesus Christ … Why is that? You are jumping from one ship of idol worship to another, except that the LDS church is a huge ship and Denver’s ship is pitifully small. Denver no longer posts hardly anything about Jesus Christ … it is about Joseph Smith and the restoration. Until you all stop worshipping mortals and turn all your focus to Jesus, you will receive exactly what you want … If what you want is the Aaronic restoration … you’ll have it. I want the Church of the Firstborn … I want higher priesthood. Are you willing to give up the past in order to have a new future? Are you willing to give up Denver in order to experience God yourself? Some believe Denver is humble, yet why would a humble follower of Jesus feel compelled to write a blog post throwing his friends underneath the bus? How many times has Denver written that we need to allow people to believe what they want to? And yet he goes against his own teaching. And it’s not the first time … Hmmm ….